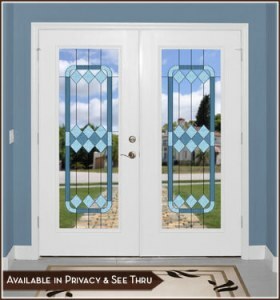 We’re excited to introduce our latest series of leaded glass door and window designs – the Cambridge design series. 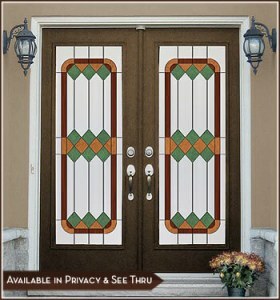 Our Cambridge door panels are an easy and affordable way to give an upscale, custom look to your glass doors and windows. These new designs will bring fresh, vibrant colors to your home or office. 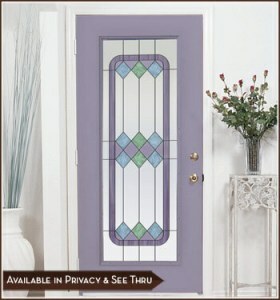 Each of our 3 Cambridge panels has a unique color palette, all carefully balanced to enhance your windows and doors. 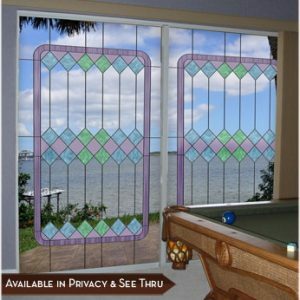 All 3 variations are available in both privacy and see-thru options. And each is available in a variety of sizes. The Cambridge I pattern is a blend of artful tones of blue (seen below, in see-thru). The Cambridge III pattern blends fresh and elegant soft shades of lavender, blue and green for universal charm (seen aside and below in both privacy and see-thru). This entry was posted by Design Team on May 3, 2012 at 9:36 am, and is filed under Decorate Glass Doors, Decorate Windows, Glass Storm Doors, In The News, Sliding Glass Doors, Window Film Basics. Follow any responses to this post through RSS 2.0.Both comments and pings are currently closed.